Bigger screen, turn-by-turn nav, even voice control. But what about compatibility? Is apple's new iPhone 5 car-friendly? Unless you've been living under a pile of discarded iPhone 3GSs, you'll know by now that Apple's new iPhone 5 is out of the bag. But is it good news for car owners? Here's everything you need to know about using the new iPhone 5 in your car. One of the big changes with iPhone 5 is the dock connector. Out goes the old 30-pin item that's been around since 2003. In comes the new Lightning port. Apple has been quick to point out that it has come up with an adapter to allow the new handset to work with old 30-pin sockets. 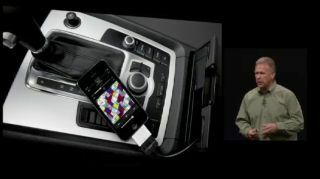 It even showed an iPhone 5 hooked up to an Audi during the keynote launch presentation. But here's the problem. Some cars hook into the 30-pin's analogue audio and video outputs, including some BMW and MINI models, for instance. But Lightning is a digital interface. Fortunately, the Apple Lightning to 30-pin adapter (yours for £25) does allow for analogue audio output, but not analogue video. So features such as iPod out on MINI Connected will be permanently borked unless someone makes an adapter that converts video as well. The old iPhone's 3.5-inch screen ensured maximum portability. But it's pretty scrawny in an in-car context. The new iPhone 5 has a bigger 4-inch, 16:9 screen with an even higher resolution 1,136 x 640 pixel screen. The latter won't help much with in-car viewing distances. Google maps is a gonner with fresh installs of iOS 6 and the iPhone 5. In comes Apple's own mapping app, with data supplied by TomTom. That should be a very good thing for car drivers as TomTom is one of, if not the, leading sat nav makers for the auto industry. For starters, you now get turn-by-turn navigation as standard in an iPhone. You'll also get really detailed traffic info, thanks in part to crowd-sourced data from Waze. Add in the larger 4-inch screen and you've got what should be a great in-car sat nav. This one isn't actually iPhone 5 specific. But it's a feature that's rolling out as the iPhone 5 arrives. Siri is coming to cars. Several manufacturers including Audi, BMW, Toyota and Jaguar will be including voice-command buttons on steering wheels to activate Siri on synced iPhone handsets. You'll get full Siri voice control functionality using the car's integrated mics and speakers. Since Siri is one of the better voice-recognition solutions on the market – and generally better than the efforts most car manufacturers have come up with – this is a good thing. Gadget-related driver distraction is becoming a major safety headache, as the social networking-obsessed attempt to text and tweet from behind the wheel. Will power would seem the obvious solution. Back in the real world, a phone that isn't constantly pinging you with tempting notification noises would help. That's where the new Do Not Disturb feature comes in. It uses the iPhone 5's accelerometer and GPS features to figure out when car and driver are on the move and slips into minimum-distraction mode, silencing alerts and keeping the screen blank. It's not the first time we've seen such a feature to combat driver distraction from smartphones. Apple has relocated the headphone jack from top to bottom. Whether this helps or hinders in-car isn't yet clear. For an iPhone in portrait position in a dock or mount, having the cable coming out of the bottom will be tidier. For phones resting more casually in cupholders, maybe not. Let us know what you think about using the new iPhone 5 in-car - will you be buying one?